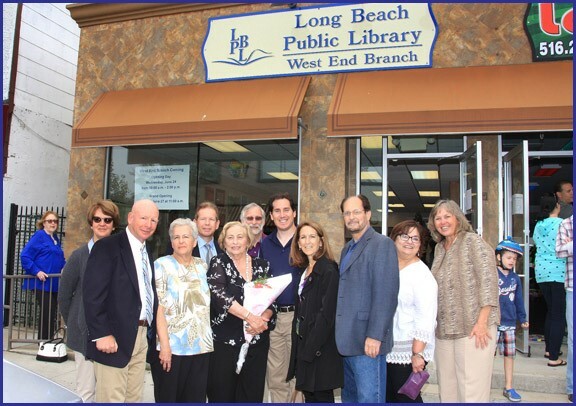 Nassau County Legislator Denise Ford joined with Kathleen Dwyer, Alan Greenberg, Diane Parr, Warren Vegh, Carol Arnone, George Trepp, Todd Kaminsky, Fran Adelson, Mark Tannenbaum, & Barbara Mosca to celebrate the Long Beach Public Library West End Branch Grand Opening! The Long Beach Public Library West End Branch is located at 903 West Beech Street in Long Beach and is open to the public every Monday from 3:00 p.m. to 7:00 p.m. and Wednesday through Saturday from 10:00 a.m. to 2:00 p.m. The West End Branch is closed on Tuesdays and Sundays.